1) Q: The painting represents events that reportedly occurred several hundred years before the artist’s lifetime. What details did he include to help bring the scene to life? 2) Q: Why do you think the artist chose this particular moment—why not simply show Saint Apollonia standing beside a shattered sculpture? 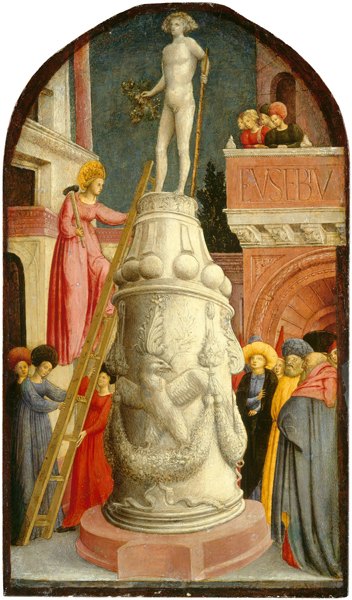 3) Q: Who or what is the focus of this painting: Saint Apollonia or the pagan idol? Use visual evidence to support your argument. A: Consider initiating the discussion with a show of hands. Or you might ask students to answer the question in debate style, assigning one student (or team of students) to argue for Saint Apollonia and the other for the pagan idol. The artist calls attention to her high earthly and heavenly stature through the crown and halo. She is the only active agent in the picture, while all others are either passive or attending to her in some way. It is physically larger than any other element and taking up a great deal of pictorial space (the base actually impinges on the viewer’s space). The white marble is among the lightest elements in the painting and therefore eye-catching. Greater detail is devoted to this passage than to any other. The antique imagery suggests erudition, raising the painting’s intellectual ambitions.